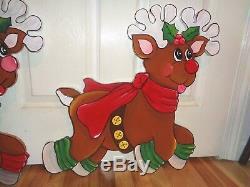 SLEIGH 27-1/2'' X 24'' REINDEERS 21'' X 21'. PLEASE DON'T WAIT ORDER NOW SO YOU WILL GET YOUR YARD ART IN TIME FOR NEXT CHRISTMAS. I DON'T KEEP THE YARD ART PAINTED UP AHEAD OF TIME. Lawn Art is handmade to LAST! Neighbors will love your decoration. DON'T WAIT TILL THE LAST MIN. 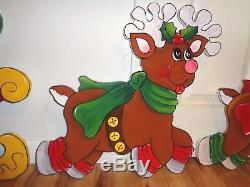 TO GET YOUR YARD ART CHRISTMAS DECORATION, START NOW AND HAVE IT ALL DONE BY THE TIME CHRISTMAS ROLLS AROUND AGAIN. All my Yard art is hand-crafted by me and are made of the best quality materials. We use 1/2 signboard which is made especially for the outdoors and will weather much better than traditional plywood. I paint a good coat of kilz oil base, which seals it. All mounting galvanized pipe are included for easy set up for garden/lawn placement. I do not use any of the polyshield for I have used about every kind of polyshield you can think of and I have not found one yet that doesn't yellow, that is why I use oil base paint cause it doesn't yellow and it has it's own wonderful high gloss shine. It may take a little longer to get the yard art done and cost a bit more for oil base paint but it is worth it in the long run, because I have never had not one call back on my yard art signs. Water base paint, if you rub with a wet cloth it will rub off down to the surface, So rain especially if you have aced rain or live in a area close to the sea or ocean and that is really rough on exterior water base paint. Trust me I use to live in Grand Isle La. Right next to the beach and I learned that you have to use a oil base paint to with stand the salt air weather. And you do not paint treated wood either, by painting treated wood causes it to rot faster. A sealer is what you use like kilz oil base on wood. 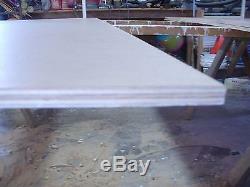 I ALSO LIKE TO USE 1/2'' WOOD ANY THING LESS THAN 1/2'' BOARDS WILL WARP. I HAVE TRIED TO DESCRIBE THIS TO THE BEST OF MY ABILITY, Delicate items are packed with extreme care and usually double-boxed if needed. Please be patient on all accounts! I'm a pretty easy person to get along with. However, I appreciate the cooperation of buyers. If anyone wants more pictures, let me know what you want pics. Be sure to add me to your favorites list! BUYERS BEWARE of yard art that uses cabinet grade birch plywood, this type of board is for interior use, used for inside cabinets and is not suitable for out side use. It will split and come apart, I myself had tried it and put in my flower garden to see how it held up in the out side weather and with in 2 months it was a disaster, it peeled split and came apart real bad. It won't hold up in any kind of weather. I use the best of board the MDO boards for my yard art, I also use exterior kilz which cuts down on the yellowing of paint, I also use exterior oil base high gloss paint. You have to use exterior when it comes to wood and paint for the out side use. Birch plywood is not exterior and they don't make exterior birch plywood. 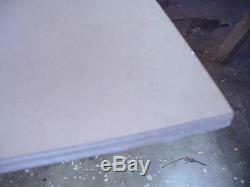 ALSO WHAT THEY ARE CALLING TRADITIONAL PLYWOOD OR EXTERIOR PLYWOOD, WOOD PRIMED. NO THIS ISN'T GOOD, AND YOU DON'T WANT IT, PLYWOOD IS NOT GOOD FOR OUT SIDE USE AND I DON'T KNOW OF ANY PLYWOOD THAT IS EXTERIOR. IT WILL SPLIT AND COME APART WITH IN A FEW MONTHS. AND IF ACRYLIC PAINT IS USED IT WILL PEEL AND FADE IN NO TIME. Which I know that, that is birch plywood and it will not hold up in outside weather. MDO boards are costly and most of the lumber yards don't handle this MDO board, the birch is like 30.00 for a 4'x 8' sheet verses the 4' x 8' sheet of MDO it costs around 60.00 to 70.00 a board. THE PICTURES OF BOARD IS ONLY TO SHOW YOU WHAT THE MDO BOARD LOOKS LIKE BEFORE YOUR ORDER IS CUT OUT AND PAINTED. IF YARD ART SELLERS STATES THEY SAND THE BOARDS, THEN THEY ARE NOT USEING MDO BOARDS. We DON'T use any other wood like cabinet grade birch plywood, traditional plywood, wood primed, Treated ply wood etc. Because these will split and come apart within a few months. Only MDO Wood has been proven to hold up in any kind of weather. 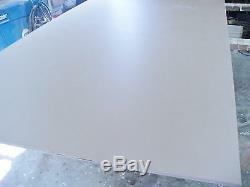 MDO BOARDS IS NOT PLYWOOD AND IF SELLERS ARE SAYING IT IS THEN THEY ARE NOT USEING MDO BOARDS, ALSO IF THEY SAY IT HAS TO BE SANDED THEN THEY ARE NOT USEING MDO BOARDS. 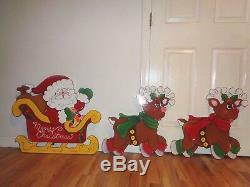 The item "MADE TO ORDER, SANTA IN SLEIGH & 2-REINDEERS CHRISTMAS YARD ART DECORATION" is in sale since Thursday, March 14, 2019. 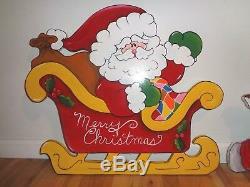 This item is in the category "Collectibles\Holiday & Seasonal\Christmas\ Current (1991-Now)\Yard Décor".2012" and is located in Greenville, Missouri. This item can be shipped to United States, Canada, United Kingdom, Denmark, Romania, Slovakia, Bulgaria, Czech republic, Finland, Hungary, Latvia, Lithuania, Malta, Estonia, Australia, Greece, Portugal, Cyprus, Slovenia, Japan, China, Sweden, South Korea, Indonesia, Taiwan, South africa, Thailand, Belgium, France, Hong Kong, Ireland, Netherlands, Poland, Spain, Italy, Germany, Austria, Bahamas, Israel, Mexico, New Zealand, Philippines, Singapore, Switzerland, Norway, Saudi arabia, Ukraine, United arab emirates, Qatar, Kuwait, Bahrain, Croatia, Malaysia, Brazil, Chile, Colombia, Costa rica, Dominican republic, Panama, Trinidad and tobago, Guatemala, El salvador, Honduras, Jamaica, Antigua and barbuda, Aruba, Belize, Dominica, Grenada, Saint kitts and nevis, Saint lucia, Montserrat, Turks and caicos islands, Barbados, Bangladesh, Bermuda, Brunei darussalam, Bolivia, Ecuador, Egypt, French guiana, Guernsey, Gibraltar, Guadeloupe, Iceland, Jersey, Jordan, Cambodia, Cayman islands, Liechtenstein, Sri lanka, Luxembourg, Monaco, Macao, Martinique, Maldives, Nicaragua, Oman, Peru, Pakistan, Paraguay, Reunion, Viet nam, Uruguay.